Home Reports Maximizing WIOA’s Potential: A Regional Analysis of the State Plans of Maryland, Virginia, and Washington D.C. 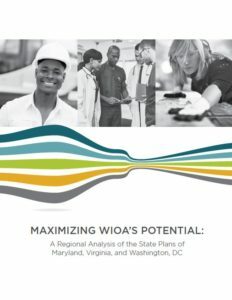 Maximizing WIOA’s Potential: A Regional Analysis of the State Plans of Maryland, Virginia, and Washington D.C. The passage of the Workforce Innovation and Opportunity Act (WIOA) in 2014 created a unique opportunity for all states to improve their workforce training and education systems. The legislation replaces the Workforce Investment Act of 1998 (WIA), and revamps state workforce systems to more effectively meet the needs of jobseekers and incumbent workers (especially those with high barriers to employment), as well as employers. By emphasizing career pathways, sector partnerships, employer/demand-driven training, coordinated performance measurement, and integration of programs, WIOA seeks to create a more streamlined, coordinated, and effective workforce system. After WIOA was signed into law, States prepared and submitted State WIOA plans to the United States Department of Labor describing how they would implement WIOA at the State and local level. As Maryland, Virginia, and Washington, DC have very close economic and labor market ties. Through the generous funding and support of the Community Foundation for the National Capital Region, JOTF worked with partner organizations in the three jurisdictions to compare several specific elements of the WIOA state plans of these jurisdictions in order to gauge the similarities and differences between the different approaches —including the greatest strengths and weaknesses. Employers: Many companies have locations in multiple jurisdictions throughout the DC-MD-VA area. A cross-jurisdictional comparison can help businesses assess the different practices or policies they may need to adopt to access the resources of each jurisdiction’s workforce system and/or benefit from their programs. Workers: Workers in the Metropolitan Washington area often change jobs across jurisdictional lines. State plans can impact such things as credential portability and the ability of workers to access training appropriate to their needs. Policymakers: Lawmakers in a single jurisdiction may be able to look to their neighbors to make improvements within their own state, and/or locate opportunities to collaborate across jurisdictional lines.